Where the -zi’s are the roots of the characteristics equation and the –pi’s are the poles of the corresponding open loop transfer function GH(s). We first map contours of the s-plane into the (1+GH)-plane, then for convenience, we omit the 1 of (1+GH) and map the contours into the GH-plane. The resulting contours provide information on the existence of roots that have a positive real part, that is, that are located in the right- half plane. The corresponding contour (or image) in the F(s)-plane encircles the origin N=Z-P times in the clockwise direction. N=the number of clockwise encirclements of the origin in the F(s)-plane. 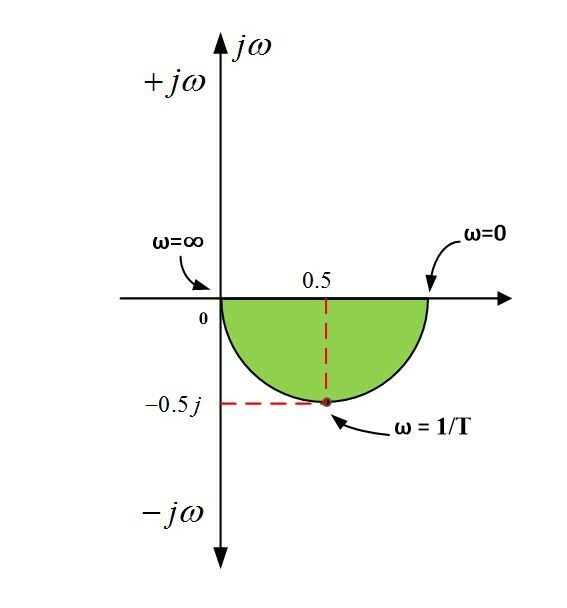 Where –si’s are the zeros of the open-loop transfer function. By finding the image in the GH-plane rather than F(s) plane, we avoid adding 1 to each of the computation. If there are no roots in the right half plane, then the system is stable. Now we shall establish the procedure for searching the right-half plane and relating the stability of the system to the polar plot. The positive jω-axis in the s-plane, used for the polar plot, will be expanded to a contour enclosing the entire right half-plane. The contour, shown in the following figure, consists of three parts. The complete contour, enclosing the entire right half-plane, is called the Nyquist contour. A smaller radius could be used if we knew that there were no roots of the characteristics equation beyond the semi-circle. 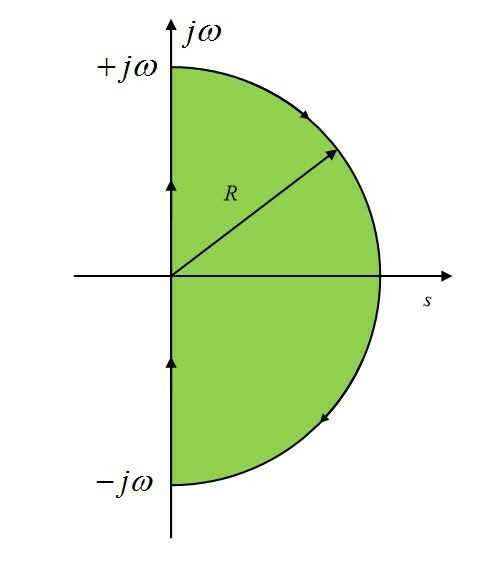 When no poles of GH(s) are in the right half of the s-plane, the corresponding feedback control system is stable if and only if the control of the image of the Nyquist contour does not circle the (-1+j0) point in the GH-plane. When the number of poles of GH(s) in the right half of the s-plane is not zero, the corresponding feedback control system is stable if and only if the contour of the image of the Nyquist contour encircles the (-1+j0) point in a counter-clockwise direction by an amount equal to the number of poles of GH(s) with positive real parts. For case 1, where P=0 we have N=Z, that is, the number of zeros is equal to the number of encirclements. For a stable system, N must be zero. For case 2, N=Z-P results in N=-P, since Z=0 for a stable system. A Nyquist plot, known as a polar plot, is a frequency response of a linear system, which means we replace s with jω in a transfer function G(s). Where T is the time constant.